1550 sq ft office located on the second floor of two story office/industrial building. Located on the corner of Hollywood Blvd and Jefferson. Unit is being completely refinished with new floors and paint. Professional 1st floor office with 1 office with glass pass-thru window to waiting room, 1 private office, 1 larger room with sink/counter & cabinets for break room, waiting room, and 1 ADA bathroom. Excellent condition, New kitchen cabinets. Very clean 2/2 with 1-car garage. End unit. Located in residential neighborhood. Sunny Hills Lot ready to build. Quick commute to Panama City Beach. Close to lakes and golf courses. Buyer to verify all pertinent information. Office space that has been updated since the current photos were taken. Space has recently been repainted and has new vinyl plank flooring installed a few months ago. Owner pays water, sewer and garbage. Tenant pays power, internet and telephone. Flexible use options. Recently used as beauty shop. Previously used for office space. 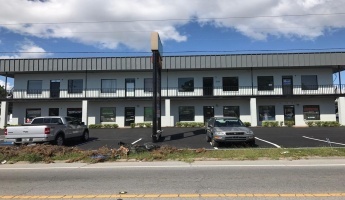 This office building is centrally located in Fort Walton Beach, right next to the main Post Office and across the street from Uptown Station - a large shopping, office, and dining area. Suite 202 consists of the reception and waiting areas, two regular size offices, two bigger size offices that can be used as conference rooms, and an open area that can be utilized for cubicles. Nice office space with reception, 3 office rooms, conference room, 2 restrooms, coffee bar. $100 monthly CAM for common area expenses and garbage. Property could be used for retail space but has very limited parking. Space next door will be available in March you could combine both spaces.